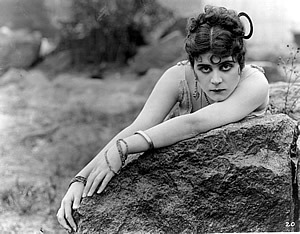 Hollywood’ s first femme fatale, Theda Bara was born Theodosia Goodman in Cincinnati, Ohio, on July 20, 1890. The daughter of a prosperous garment factory owner, she spent two years at the University of Cincinnati before her family moved to New York City in 1905. There, she began pursuing an acting career with limited success. In addition to working as a film extra, she made her Broadway debut in The Devil (1908), billed (using her mother’s maiden name) as Theodosia de Coppet. Though undistinguished, her early work brought her to the attention of film director Frank Powell, who cast her as the lead in A Fool There Was (1915). Based on a play inspired by Rudyard Kipling’s poem The Vampire, the silent movie told the story of a seductress’s destruction of an upstanding married man who falls under her spell. 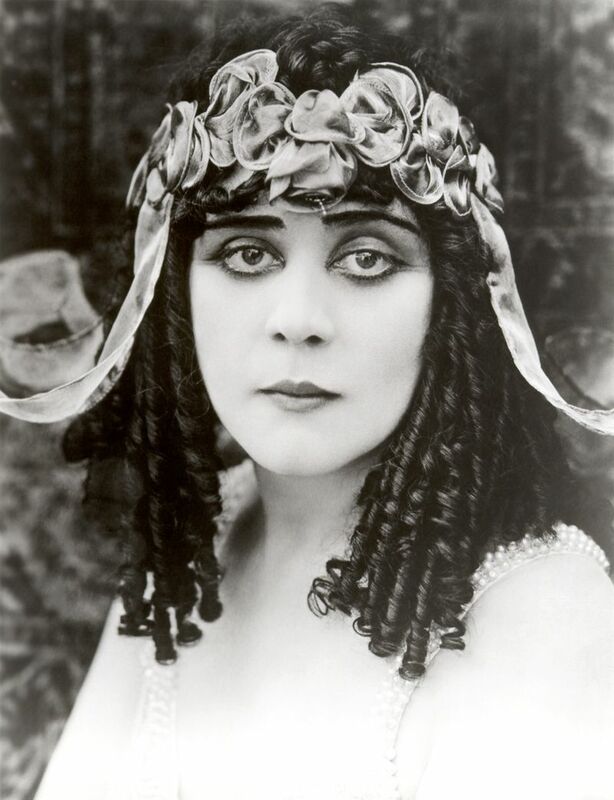 Fool was an enormous success, and Goodman, now acting under the stage name Theda Bara, became an instant star. Her new acclaim was largely due to a publicity campaign orchestrated by the Fox Film Company. With her name, Bara was given a new personality and history by studio’s publicity machine. The press was told that she was born in an oasis in the Sahara Desert, the product of an illicit relationship between a French artist and his Egyptian mistress. 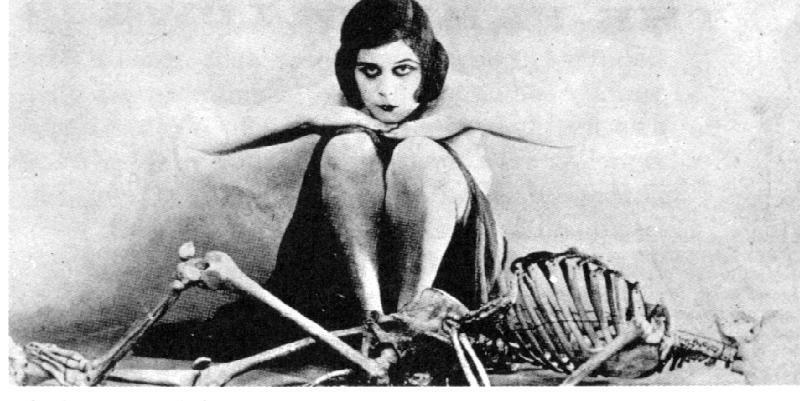 “Theda Bara” was said to be an anagram for “Arab Death,” a claim seemingly supported by publicity stills that showed a heavily made-up Bara dressed in exotic costumes and surrounded by skulls and skeletons. As overblown as Bara’s public persona was, it struck a chord with her mostly female audience. Some female moviegoers were so appalled by Bara’s man-destroying “vamp” that they destroyed posters bearing her image and spearheaded church-spon-sored campaigns to ban her films. Bara tried to revive her vamp character on Broadway in The Blue Flame (1920) but was laughed off the stage. She made a few more attempts at a comeback before retiring in 1926. Her last film was Madame Mystery (1926), a comedy short directed by Stan Laurel, in which Bara herself lampooned the roles that had made her famous. She spent the rest of her life out of the limelight, sharing a Beverly Hills home with one of her film directors, Charles J. Brabin, whom she married in 1921. On April 7, 1955, Bara died of cancer at the age of 69. With the exception of A Fool There Was, Bara’s films are all now lost. Still, the screen’s original vamp has had a long-lasting influence. Through her phenomenal success, she was the first to show Hollywood the popular appeal of the “bad girl”—a lesson the film world has well remembered ever since. Bodeen, DeWitt. From Hollywood: The Careers of 15 Great American Stars. South Brunswick, N.J.: A. S. Barnes, 1976. Genini, Ronald. Theda Bara. Jefferson, N.C.: McFarland & Company, 1996. Golden, Eve. Vamp: The Rise and Fall of Theda Bara. Vestal, N.Y.: Emprise, 1996.